GRS staff have extensive experience in site investigation design, implementation and supervision for a wide range of geotechnical projects including transportation infrastructure, water supplies, foundations, contaminated land and quarries in a variety of geological and geographical settings, both onshore and offshore. GRS use engineering geological models in combination with the required engineering performance, to evaluate project specific engineering geological uncertainty and hazard. As a result of this approach, site investigations target areas of potential uncertainty and therefore reduce project risk. GRS undertake all the engineering geological logging of GI stations in order to maximise the information obtained. GRS are involved with each stage of the site investigation, including the logging of drillholes and trial pits. 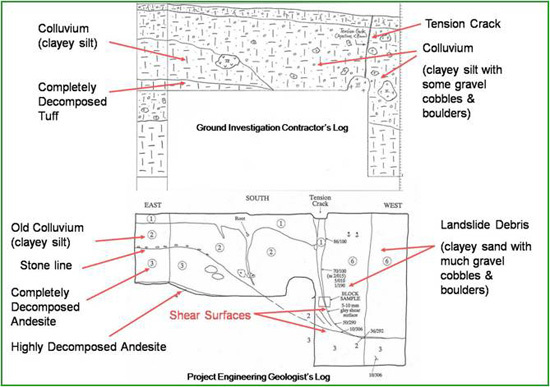 Contractors are rarely provided with the results of the desk study or initial models and consequently, the resulting logs may lack critical details. GRS use the framework of engineering geological models to maximise interpretation and therefore minimse uncertainty. (After Parry, S. & Campbell, S. D. G. (2007). Deformation associated with a slow moving landslide, Tuen Mun, Hong Kong, China. Bull. Eng. Geol. Env. Vol. 66 p135-141).